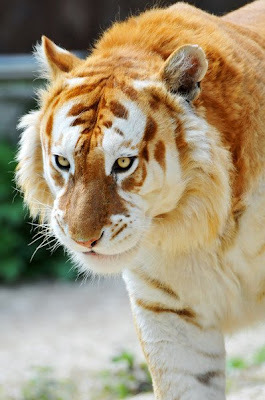 Beautiful Golden hair tiger and White Tigers are amongst the most ferocious animals that inhabit planet earth. They are dreaded by human beings as well as other animals of the jungle. Essentially, tigers belong to the cat family and are the wild species of the smaller domesticated pets people keep at home. There are varied species of tigers that are found in various places of the world, amongst them is the most endangered species: The white tigers. 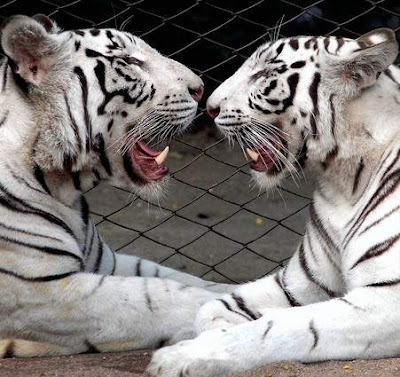 The white tigers are also known as the Bengal Tigers, as well as the Indian tiger. The scientific name for this animal is Panthers Tigris, and are found in Asia, more specifically in the India subcontinent. In its natural habitat the white tiger is found in the dense forest and fertile grasslands. This species of the tiger normally reaches its full adult size at the age of two to three years. The male generally 200 to 230 kilograms and grows up to three meters in length. On the other hand the females weigh between 130 to 170 kilograms. They grow up to the length of to 2.5 meters. The tigers of this species have stripes that look like fingerprints all over their body. Another distinguishing characteristic feature of the Bengal tigers is that they have a distinct white spot, which is on the back of their ears. This look likes an eye. They can run up to a maximum speed of 60 kilometers per hour. However, in spite of this they do not possess optimum stamina and need to sleep for an average of 16 to 18 hours, per day. The Bengal tigers are very patient when trying to catch their prey, patiently waiting to make the perfect move. They generally hide in the tall grass areas so that they can catch their prey unawares, without having to make much of an effort. This tiger species can swim swiftly in water. Another unique characteristic of this species is that it can shed, as well as grow its body hair according to the temperature.